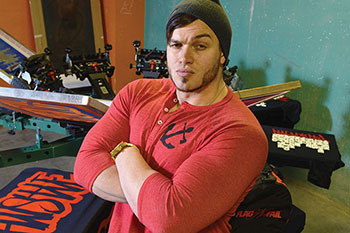 READING, PA — When Robert Bailey started his own clothing line, he had no idea that his lack of screen-printing knowledge and funds would actually work to his advantage. 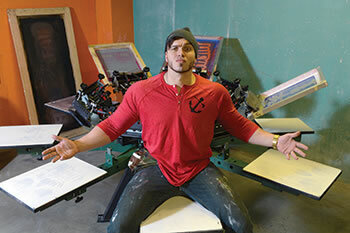 With only $400 to his name, Bailey spent every penny on tank tops and started printing them with an old manual screen printing press that had been sitting idle in his garage. "I went with the hand-printing process because I didn't have enough money to buy an automatic press," he explains. "The press was so old that the pallets were warped, and it wouldn't register properly, so the ink was positioned differently on every shirt." Despite the press's shortcomings, Bailey found a beauty in creating limited one-of-kind prints that soon became the mainstay of his brand. "I had no idea what I was doing when I started the business," he says. "I didn't know, for example, that when you lay down two colors you don't want to lay prints over each other because you're going to have bumps and different opacities based on the ink you're using." As a result, he printed hand-script fonts over large block fonts and ended up with what looked like graffiti. "It gave a cool element to the shirts," he says. But the machine's damaged pallets and lack of registration also caused him financial hardship. "It was great that this 'controlled chaos' allowed me to capture a creative angle for the brand, but it was affecting my bottom line," he admits. "I had to reject about 25 percent of my product because the press was so poor." With social media outlets as his only source of marketing, Bailey's business, Flag nor Fail, soon went viral, growing at an astounding rate of 20% a month. His shop quickly outgrew the confines of his garage, so he moved into a warehouse, hired two employees, and started looking for a new printing press. His Internet search led him to Vastex in Allentown, PA.
"Going to the showroom sealed the deal for me," says Bailey. He purchased an 8 color/8 station V-2000HD manual press. "The screen adjustment, the hardware, the hydraulic lift instead of springs, the heavy-duty construction — I can tell I'll have this forever." Unlike Bailey's previous press, the V-2000HD has metal pallets so he doesn't have to worry about warping. 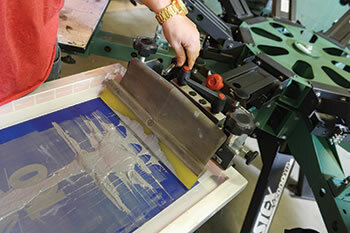 "With the original 4 color/4 station press, I had to skip one of the stations because it was so warped," he says. Now, with a total of eight stations and all-heads-down capability, Bailey has two people printing different jobs on press at the same time-one on each side of the machine. 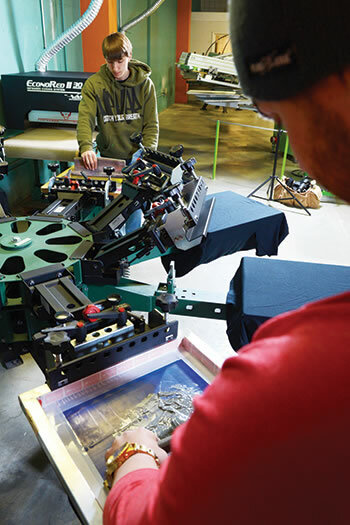 With all-heads-down printing capability, each pallet can serve as a single-color print station, allowing multiple operators to work on the press at their own pace. 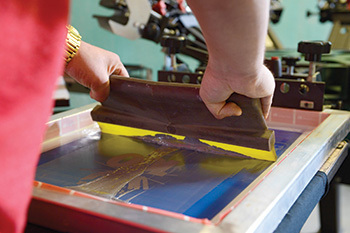 While the faulty registration of Bailey's original press helped create his brand, the accurate registration of his V-2000HD press simulates faulty registration with garment-to-garment consistency. "The screens are on hinges, and when they come down they lock in the registration before they touch the pallet," explains Bailey. "The machine is constructed so that all eight screens can come down at the same time, and the registration's always on for all of them." The press's micro-registration knobs also allow Bailey to adjust the print head incrementally for repeatable accuracy. "I rarely have to use the micro registration," he says, "but when I do it's easy. With other machines, you'll get a thousand shirts in, and your registration will start to slide off a little bit. We use this machine's micro-registration to finalize the lineup, and then it never goes off after that." One of Bailey's more challenging jobs is printing text over zippers and pockets on hoodies. "It was difficult to print on the old machine because the ink would pool up on either side of the zipper, and in other places the ink didn't hit as much," he says. 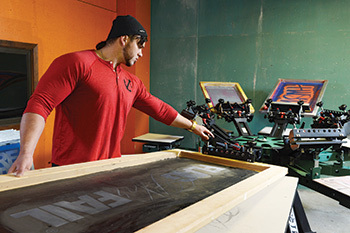 Now, he can print hooded sweatshirts with ease while still retaining the garment's unique, hand-printed appearance. "This winter we did tons of hoodies, and people responded really well because there's nothing like that on the market," says Bailey. "Everything you get in the stores is so clean because they use an automatic press, but no one is printing 'dirty-looking' fronts. It's more like art on a shirt." 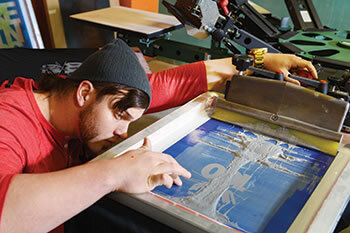 When Bailey started printing 2 x 5 ft (0.6 x 1.5 m) banners, he thought he would have to invest in a different machine. But Vastex built a 3 x 5 ft (0.9 x 1.5 m) pallet to accommodate the banners on Bailey's current press. "On any other press, it would be too much stress because the screens are made of heavy two-by-fours," explains Bailey. "But the Vastex machine handles the weight of a 3 x 5 pallet and a 3 x 5 screen." Bailey also purchased a Vastex EconoRed II infrared dryer with a 30 in. (76 cm) belt and dual chambers. By adjusting the belt-to-heater height, Bailey can accommodate bulky items, such as hooded sweatshirts - yet do so in a smaller footprint. After moving into the warehouse, Bailey bought a second EconoRed II dryer and a 4 color/4 station V-2000HD press. One month later, he repeated the same order for a 4 color/4 station V-2000HD and an EconoRed II dryer. Now, he can print girls' tank tops on the 4 color/4 station V-2000HD, guys' shirts on the 8 color/8 station V-2000HD, and specialty items on the second 4 color/4 station V-2000HD. "It's nice because I don't have to change out pallets," he says. With catch phrases, such as "Work is in my blood" and "Never settle," Bailey's T-Shirts and tank tops reflect his work ethic. 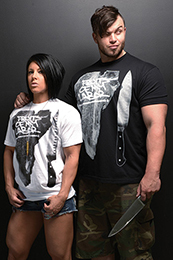 He and his wife Dana Linn have attracted an international following, and travel to gyms and fitness events worldwide to spread their message. 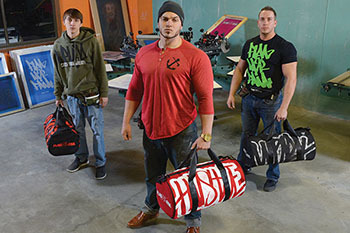 Business is booming and once again Bailey is moving into a larger warehouse. In addition to housing the print shop, the new warehouse will have a car shop, a private training gym, and a recording studio. 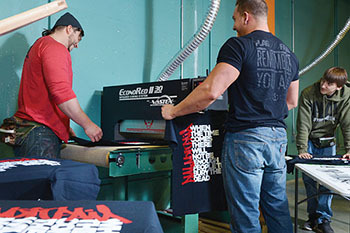 Bailey plans to hire a print manager and purchase another 4 color/4 station V-2000HD press to keep up with the demand for T-Shirts promoting his new business ventures. But Flag nor Fail's phenomenal growth is not without challenges: "The more the business grows the more problems arise," says Bailey. "I'm having problems with the buildings I'm renting, the work vehicles, the computers, the staff, the bank -- everything except the presses." 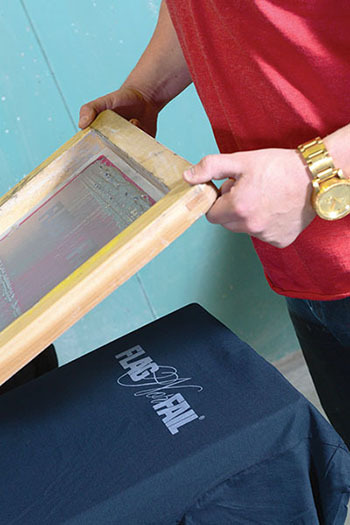 Tim Hauck, Rob Bailey and Dustin Mitchell model Flag Nor Fail's unique hand-printed out-of-register looking designs. 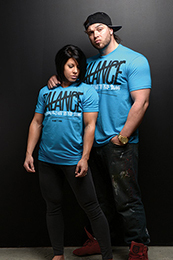 Rob Bailey and wife Dana Linn, shown modeling Flag Nor Fail's printwear, appear at gym and fitness events worldwide. 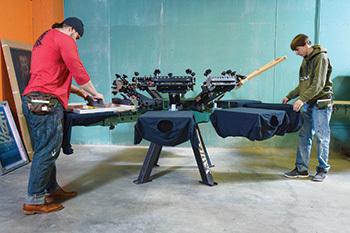 Rob Bailey, sitting on a pallet, demonstrates the weight capacity of his Vastex press, which he uses to print 3 x 5 ft (91 x 152 cm ) banners as well as garments. with two people printing different jobs. One color has been applied on the logo. 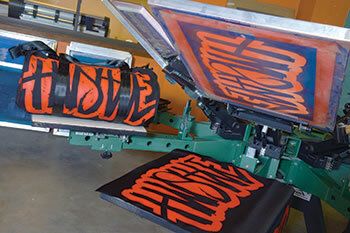 The Vastex manual press accommodates oversize pallets for jobs such as banners. 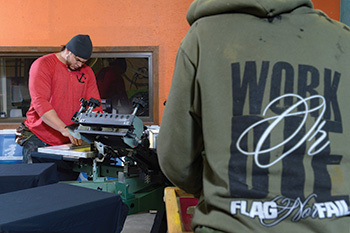 Rob and Dustin load shirts into Flag Nor Fail's EconoRed II 30 in. (76 cm) wide infrared conveyor dryer. Tim Hauck and Dustin Mitchell apply ink to the screen, as Rob Bailey draws the squeegee. Rob Bailey micro-registers the press for repeatable accuracy.